Alleged victim of ritual murder by Jews at Norwich in 1144. He may therefore claim to be the protomartyr of this class of pseudo-martyrdom. According to the boy's own family, he was enticed away on Monday, March 21, 1144, to become a scullion of the Archdeacon of Norwich, and was not heard of again till Saturday, March 26, when his uncle, cousin, and brother found his body, covered with sand, in Thorpe Wood, near Norwich, with the head shaven and with marks of puncture by thorns. 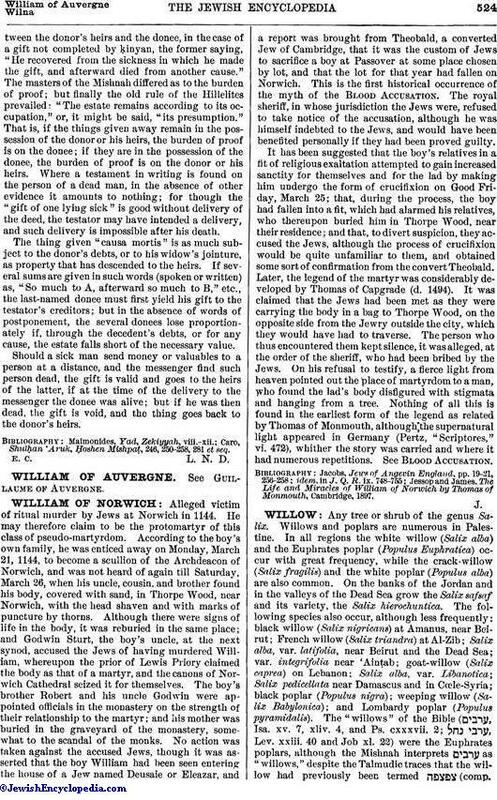 Although there were signs of life in the body, it was reburied in the same place; and Godwin Sturt, the boy's uncle, at the next synod, accused the Jews of having murdered William, whereupon the prior of Lewis Priory claimed the body as that of a martyr, and the canons of Norwich Cathedral seized it for themselves. The boy's brother Robert and his uncle Godwin were appointed officials in the monastery on the strength of their relationship to the martyr; and his mother was buried in the graveyard of the monastery, somewhat to the scandal of the monks. No action was taken against the accused Jews, though it was asserted that the boy William had been seen entering the house of a Jew named Deusaie or Eleazar, and a report was brought from Theobald, a converted Jew of Cambridge, that it was the custom of Jews to sacrifice a boy at Passover at some place chosen by lot, and that the lot for that year had fallen on Norwich. This is the first historical occurrence of the myth of the Blood Accusation. The royal sheriff, in whose jurisdiction the Jews were, refused to take notice of the accusation, although he was himself indebted to the Jews, and would have been benefited personally if they had been proved guilty. It has been suggested that the boy's relatives in a fit of religious exaltation attempted to gain increased sanctity for themselves and for the lad by making him undergo the form of crucifixion on Good Friday, March 25; that, during the process, the boy had fallen into a fit, which had alarmed his relatives, who thereupon buried him in Thorpe Wood, near their residence; and that, to divert suspicion, they accused the Jews, although the process of crucifixion would be quite unfamiliar to them, and obtained some sort of confirmation from the convert Theobald. Later, the legend of the martyr was considerably developed by Thomas of Capgrade (d. 1494). It was claimed that the Jews had been met as they were carrying the body in a bag to Thorpe Wood, on the opposite side from the Jewry outside the city, which they would have had to traverse. The person who thus encountered them kept silence, it was alleged, at the order of the sheriff, who had been bribed by the Jews. On his refusal to testify, a fierce light from heaven pointed out the place of martyrdom to a man, who found the lad's body disfigured with stigmata and hanging from a tree. Nothing of all this is found in the earliest form of the legend as related by Thomas of Monmouth, although the supernatural light appeared in Germany (Pertz, "Scriptores," vi. 472), whither the story was carried and where it had numerous repetitions. See Blood Accusation. Jessop and James, The Life and Miracles of William of Norwich by Thomas of Monmouth, Cambridge, 1897.